A celebrated medical lecturer began one day “Fumigations, gentlemen, are of essential importance. 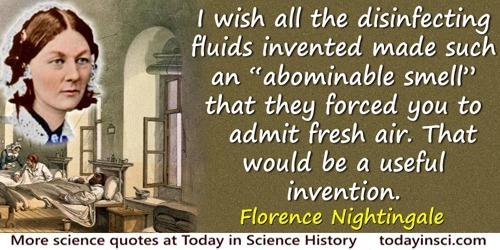 They make such an abominable smell that they compel you to open the window.” I wish all the disinfecting fluids invented made such an “abominable smell” that they forced you to admit fresh air. That would be a useful invention. In Notes on Nursing: What It Is and What It Is Not (1860), 28. I saw [Linus Pauling] as a brilliant lecturer and a man with a fantastic memory, and a great, great showman. I think he was the century’s greatest chemist. No doubt about it.